Symantec Website Security Solutions allow companies and consumers to engage in communications and commerce online with trust and confidence. With more than one and a half million web servers using our SSL certificates, an infrastructure that processes more than four and a half billion certificate checks daily, and a trust mark that is seen more than half a billion times a day in 170 countries, the Norton Secured seal is the most recognized symbol of trust on the Internet. In the age of digital transformation trust is key to the growth of services in both the public and private sectors. With more and more services evolving and innovating around digital identity there is a universal need to bridge and balance business incentives with government requirements. At Kantara Initiative we see the transformation cycle as a 4 stage process: strategy setting, innovation, deployment, and assurance. Few, if any, organizations can succeed at all of the strategic stages of change and innovation in isolation. 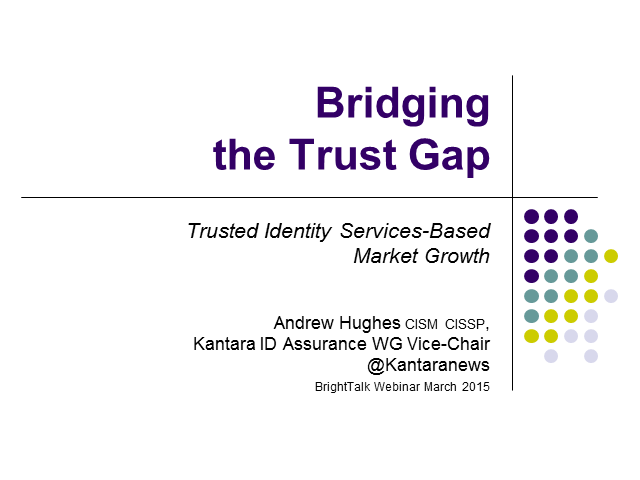 We invite you to join us to discuss how trust frameworks will evolve to bridge the digital transformation of identity assurance. Managing a secure SSL environment is getting complex. Recent industry standards and security vulnerabilities required IT to migrate from SHA-1 to SHA-2 hash algorithm, find alternatives for certificates with non-fully-qualified domain (FQDN) names and replace certificates impacted by the Heartbleed vulnerability. In addition, initiatives like Google’s “HTTPS everywhere” or always-on SSL on Google search may increase the deployment of SSL certificates in an organization. All these changes add to the challenges of managing SSL certificates. In the meantime, IT managers have to continue to provide optimal system performance to meet their users’ needs while staying within their budget. Cryptography is the practice and study of techniques for keeping secrets. While the practice of keeping information hidden, or secured, has been around throughout the history of mankind, Modern Cryptography has evolved into much more. Now we use various algorithms (a fancy word for mathematical formulas) to not only keep information secured (Confidentiality), but also to authenticate the message and the originator of that message (Authentication); to stop the sender of the message from denying they sent it (Non-Repudiation); and to make sure that the information has not accidentally or purposely altered or corrupted (Integrity). This basic workshop will explain the basic concepts discussed above, as well as the differences between Symmetric and Asymmetric encryption. We will discuss Steganograhy, Digital certificates, Public Key Infrastructure and Digital Signatures. Although the workshop is to enhance basic understanding of these concepts, anyone studying for one of the major certification examinations in information security, such as the recently launched EC-Council Certified Chief Information Security Officer (C|CISO) will need to have a good grasp of these important concepts. Vendors are priming a great future when the Internet of Things (IoT) becomes a reality. The reality is that the Internet of Things is here today. IoT has been with us in various incarnations over the last ten years or so. To protect yourself, your network and your business you need to think of the larger picture of securing the device to the network and back again. IoT today is in its infancy, even though it’s been around a long time. There are no standards overall and there are industry nuances that further complicate security. It is extremely challenging to maintain a successful online business. The landscape is crowded and competition fierce. It is not enough to just have a good product; companies really have to stand out to attract online shoppers. On top of that, news of stolen identities from cybercriminals add yet another barrier as shoppers become very cautious about which online sites to trust their information to. Last year brought a lot of news about government snooping and public attacks against certain encryption and hash algorithms. These developments should concern anyone that values data privacy. View this recorded session with the Online Trust Alliance and Akamai Technologies to discover the current best practices in securing your website and internal infrastructure. Learn how to implement Always on SSL (AOSSL) and Perfect Forward Secrecy (PFS) to better secure your data. The Internet of Things is Coming: What Can Possibly Go Wrong? The buzz phrase du jour, the ‘Internet of Things’, – AKA the “Internet of Everything” – refers to a myriad of everyday devices which are being connected to the Internet, each with its own IP address. The IoT will comprise large numbers of such low-cost “smart” devices, up to 26 billion by 2020, according Gartner. They range from “smart” watches (Hi Apple!) to microwaves, and heart monitors to “smart” power grids. Predictably, the hype about the future benefits is in full force. And, yes, some of these benefits may actually happen. However, based on past disruptive trends, we can be certain that: (1) hackers, crackers, and attackers will not be slow to spot new opportunities for badware; (2) the IoT will generate gigantic amounts of data at very high velocity, with associated privacy concerns, and (3) boring stuff like updates and patches are going to be tough to do. The question, “What Can Possibly Go Wrong?”, must temper out enthusiasm for this immersive new environment so that we can avoid some of the security disasters of the past, particularly in sensitive industries, like healthcare and nationwide utility grids. This session will review the IoT from the viewpoint of cybersecurity and data privacy and develop some guidelines for the pragmatic and cautious user. Today’s enterprises are challenged to maintain and secure large intranet networks and to keep them compliant with changing regulations. Securing communications within these environments presents any number of security, financial, and personnel concerns. Solutions range from single-domain intranet SSL certificates, Wildcard certificates to Self-Signed Certificate Authorities (CA). Symantec™ Private Certification Authority (CA) provides a hosted private SSL certificate hierarchy and end-entity certificates specifically built to secure your internal communications. Consolidate your public and private SSL certificates onto one management console, Symantec™ Managed PKI (MPKI) for SSL. Join us to learn about Symantec Secure App Service - a better way to sign code and secure applications. Traditional code signing provides a way for software publishers to assure their customers that the apps and files they have downloaded are, indeed, from them and have not been tampered with. Unfortunately, inadequate controls around this process can lead to malware propagation. Compromised certificates make news headlines and can lead to poor reputation for your company, and revoking these certificates could result in your distributed applications to suddenly appear as untrusted. Symantec Secure App Service is a cloud-based code signing and management solution with a complete range of services to help enterprises control and secure their code signing activities and keys easily. Services include vetting and approval of software publishers, code signing, key protection and revocation, administrative controls, reporting and audit logs.